The Core Disassociation Exercise teaches you how to move your upper torso (chest and shoulders) independently of your pelvis and hips, helping you to both create and close the separation of your shoulders and pelvis for power and consistency in your golf swing. The Core Disassociation Exercise forms part of the Golf Mobility series of innovative and dynamic exercises that will help to improve your joint and muscle mobility, improving your range of motion while increasing functional strength within the entire range of that motion – thus helping to prevent injuries and building the foundation for a consistent, accurate, and powerful golf swing. Start by standing with the perfect stance width and spine angle. 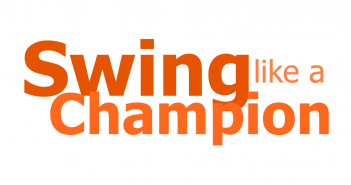 See Golf Swing Drill 102 – Setup: Perfect Golf Stance Width and Ball Position and Golf Swing Drill 103 – Setup: Perfect Golf Spine Angle. Don’t tilt your spine away from the target for this exercise. Stand with your arms folded in front of your chest. Without moving your pelvis or hips, slowly turn your upper torso (chest and shoulders) to the right. Hold that position for a second, then return your chest to the midline, and repeat to the left. Make sure that you maintain perfect posture throughout this drill, keep your shoulders back, your back straight, and your abdominal muscles engaged. Perform this drill in front of a mirror to make sure your pelvis and hips do not move as you turn your shoulders and chest. With practice you should be able to do this without feeling that you need to resist with your pelvis and hips — you are learning to rotate your upper and lower torso independently. If, at first, you find it difficult to turn your torso very far without pulling your hips with you, then try this drill while sitting on a chair, with your feet planted on the floor, and really concentrate on the feeling of your obliques pulling you around. Also, it is important to keep working on the Pelvic Disassociation Exercise to develop your muscle control. Make sure that you do not push with your trailing shoulder, both shoulders should remain connected but totally passive, the movement is made by pulling with your obliques. 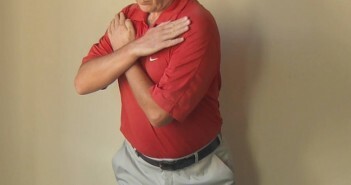 Place your fingertips lightly on each shoulder so that you can feel if your shoulders try to push. Concentrate on your core, especially your obliques, isolating the movements to your trunk. Your legs should not move at all. You should find that, with practice, you are able to turn your shoulders 45 degrees each way using only your abdominal muscles. The associated Pelvic Disassociation Exercise can help you to feel and isolate the abdominal muscles used for this exercise. The ability to separate your pelvis from your shoulders is crucial for a good golf swing, especially in the downswing. This separation (the so-called X-factor) enables you to generate more power by stretching out the big muscles in your core as you coil your torso, and by generating lag in your swing through the compound pendulum effect. 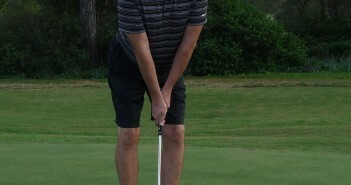 If you can’t properly separate your pelvis from your shoulders, not only will you lose club head speed through impact, but you’ll rotate your whole body at the same time during your golf swing, causing a weak and destructive over-the-top or out-to-in swing path, often resulting in a horrible slice. This core disassociation exercise, in conjunction with the Pelvic Disassociation Exercise, teaches you how to move your shoulders independently of your pelvis, helping you to both create and close the separation of your shoulders and pelvis for power and consistency. This exercise mainly involves your internal obliques, external obliques, gluteus medius, piriformis and transversus abdominis.